The city is replacing old green trash receptacles, almost indistinguishable from planters, with new black containers, municipal officials announced on Thursday morning. 300 receptacles will be deployed throughout the city at the end of 2019. Public works director William “Billy” Rodriguez said 160 will be deployed this year. The new receptacles, 61 of them, will be deployed on Market Street from Memorial Drive to Cianci Street and Main Street from Memorial Drive to Ward Street, said Penni Forestieri. director of the Urban Enterprise Zone. Forestieri is contributing $4,000 to purchase cans for the program dubbed by the mayor as “Paterson is Picking Up.” Rodriguez said the total budget is $16,000. The city is contributing funds from the Clean Communities grant, he said. 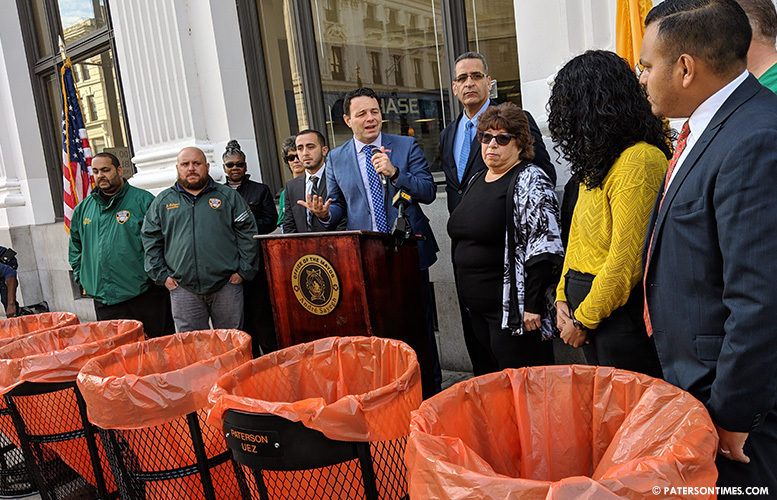 Luis Velez, 5th Ward councilman, said the new containers, black with orange bags, will help to avoid a common problem: some people confuse the green trash cans and the planters. Often, planters throughout the city are filled with trash as a result. “The perception that you are able to litter and throw your garbage on the street will not be accepted,” added Al Abdelaziz, 6th Ward councilman. Sayegh said the Chase Bank branch has agreed to help clean the downtown. A representative for Chase Bank said an email will be dispatched to employees to volunteer to clean up the city. Employees volunteer on the clock. Sayegh said the planters will be re-planted. He identified City Green as a partner for re-planting. But a representative for City Green said her organization and a partner group will plant Daffodils in planters on 21st Avenue. City Green will work with partners, she said, but not take on the burden of planting all the city’s planters in downtown Paterson. Jasmine Moreano said her group is planting 5,000 Daffodil bulbs. She said Daffodils are planted in the fall and bloom in the spring. The mayor has launched several initiatives to clean up the Silk City, among them a program that deployed a dozen people to pick up trash from main commercial areas. “We will make sure we are committed. This is not going to be a one-shot deal,” said Sayegh.